Thread by @LouiseMensch: "Veteran @MaxRose4NY⁩ (D): “After our city and country were attacked we were very clear with the Taliban — give up Bin Laden and al Qaeda, or […]"
Sandy Hook means “Play the Joker”; for Gnostics, Jesus is the Joker. An FBI & CT Police Drill was being conducted the day of Sandy Hook; the alleged school filmed by the news crews however, was a closed Mental Institution. Hurricane Sandy was planned by FEMA on Disaster Planning Maps to travel up the coast of the US & “Hook” into NY Harbor. The East Coast HQ of the Church of Satan is in Sandy Hook. 2. Make the @GOP admit they are really traitors or, if not, willing to remove their own party's President. Whether motion passes or fails, the 116th @HouseJudiciary can bring impeachment articles. Make the 115th @GOP go on record as #AQ supporters. Then make them own it in 2020. 3. Trump and his pal @RT_Erdogan are supporting the ISIS AQ Jihadists. Teach the Manbij Jihadist force what being a US enemy means. @CENTCOM must unleash B-1 racks of SDBs for 12 hours of hell. Put Al-Qaeda and ISIS on the run. 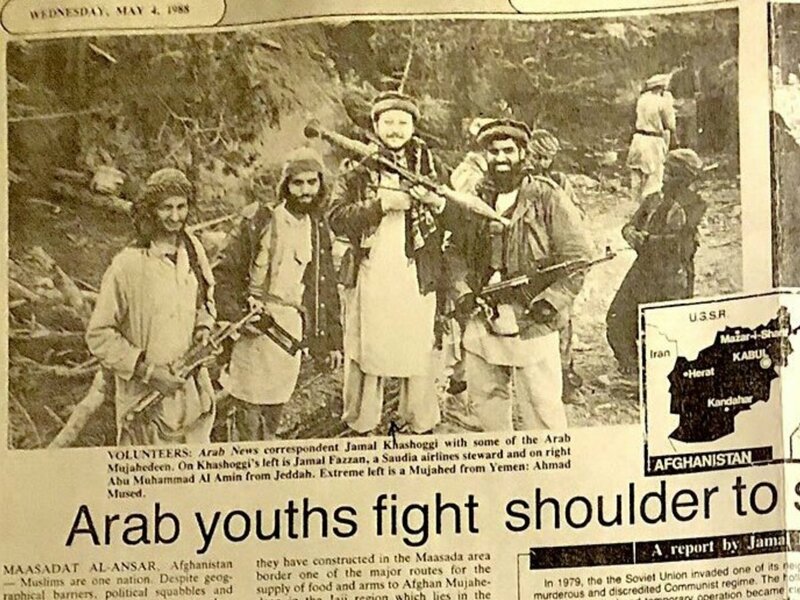 I didn’t realize until yesterday that Jamal Khashoggi was the author of this notorious 1988 Arab News article of him tooling around Afghanistan with Osama bin Laden and al-Qaeda co-founder Abdullah Azzam. He’s just a democrat reformer journalist holding a RPG with jihadists. Additional people died of 9/11-related cancer and respiratory diseases in the months and years following the attacks. The idea for the attacks came from Khalid Sheikh Mohammed, who first presented it to Osama bin Laden in 1996. 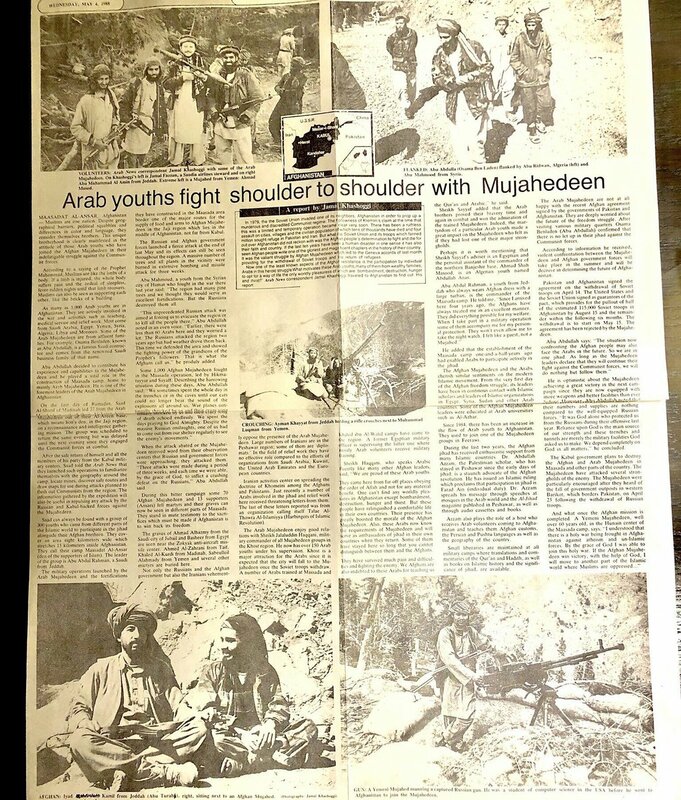 At that time, bin Laden and al-Qaeda were in a period of transition, having just relocated back to Afghanistan from Sudan. NEW - #Ahrar al-Sham & Nour al-Din al-Zinki have merged, creating Jabhat Tahrir Souriya, branded with “green” revolutionary flag. “JTS” calls on other groups to join for greater unity. #pt: What does “JTS’s” formation mean? - Unlikely to be a full merger, but closer Ahrar-Zinki coordinating ties have been clear for months. - Northern #Syria’s two biggest non-#HTS factions are compiling (with Syrian Islamic Council backing) pressure on #Jolani & HTS. I’m told that x4 sub-factions of #HTS have agreed to join the newly formed Jabhat Tahrir Souriya (#JTS) and at least x5 others are negotiating possible terms. 1/ THREAD. Mueller's indictment of 13 people far away from US jurisdiction and who won't appear for trial reminds me of a similar and very publicized but under-discussed incident just as he assumed FBI directorship. 2/It was presaged a few months earlier by an incident that I just noticed and resonates to this day. It goes back to v important 1996 Khobar bombing incident. Considerable evidence pointed to Osama bin Laden and Al Qaeda (who were not nearly as well known then as now).